This publication The clover mite can become an annoying household pest, especially in and around homes where new lawns are being established or where there’s a heavy growth of well-fertilized grass close to foundation walls. The mites are very tiny creatures (smaller than a pin head) and may occur in countless numbers. Clover mites can be distinguished from other mites due to their unusually long front legs. These are twice as long as the other legs. They usually appear first around windows, but later may overrun the entire home. They do not bite people or cause any damage indoors, but are extremely annoying and may leave a red stain when crushed. Clover mites feed on grasses, clovers and certain other plants in the lawn and around the home. They often crawl into cracks and crevices to molt and lay eggs. Typical “hiding places” are under the loose bark of trees, on foundations walls, beneath siding and around window frames. Clover mites are most abundant in the fall and spring and are relatively inactive during the hot summer months and again during cold weather. They migrate into homes either when population pressure becomes too great or when feeding conditions become unfavorable, such as the onset of hot or cold weather. 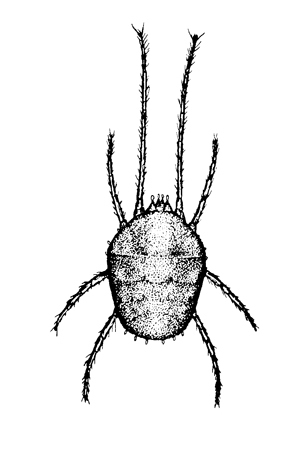 Line drawing of a clover mite. Once inside a home, clover mites are difficult to control. Although those present can be killed with household labeled sprays, more are likely to show up. Thus, prevention, keeping the mites from ever entering the home, is the best approach. The following are preventive and control measures that have proven to be effective. Grass and shrubbery growing against foundation walls make it easy for mites to get from lawn to house. To prevent easy access, lay a barrier of pea gravel 18-24 inches wide along the foundation walls. If pea gravel is not practical, leave bare soil or use flower beds as the barrier. Spray both barrier strip and foundation walls with a miticide. Where possible, also treat the inside of the foundation walls, including the plates and areas above them. If there is no barrier strip, treat foundation walls and the grass itself for a distance of 10-20 feet outward from the walls. Miticides effective and safe for use as barrier sprays (described above) include pyrethrins and synthetic pyrethroids. The proper spray concentration will depend on whether or not flowers and shrubs are in the area to be treated. Follow label directions closely. At first sign of mite invasion, paint or spray window channels and outside frames with a labelled formulation of one of the miticides. Also, treat any other obvious entrance points. Repeat as necessary. 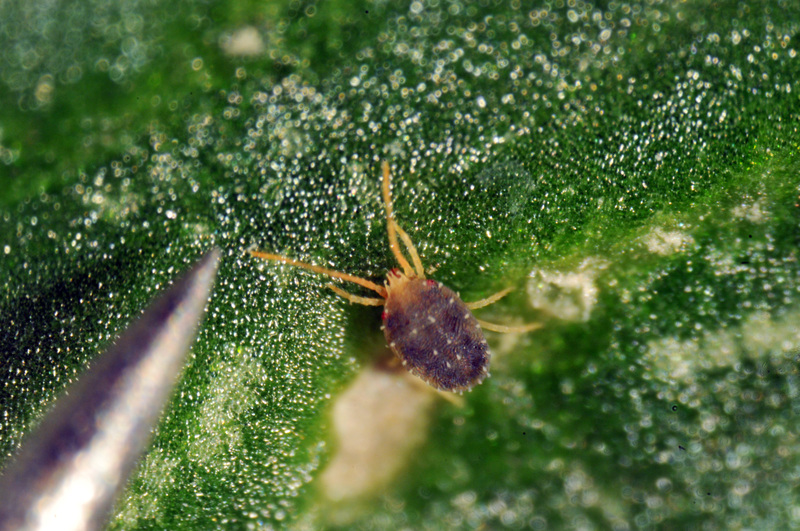 Mites indoors can be killed with a spray containing synergized pyrethrins, but direct contact is necessary and permanent protection cannot be assured. Vacuuming will provide short term relief. In situations where mites are especially difficult to control, consider the services of a commercial pest control specialist.